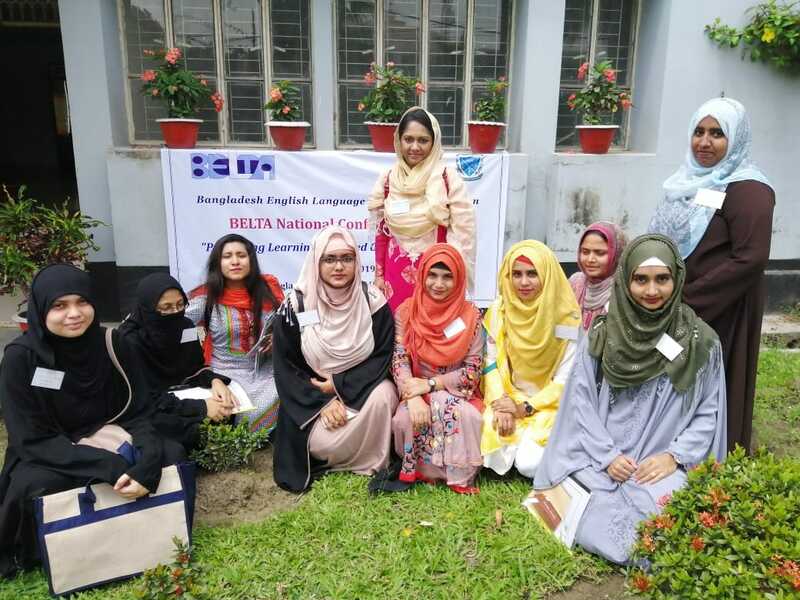 Nine undergraduate students and four faculty members of the department of English of Daffodil International University took part in BELTA (Bangladesh English Language Teachers Association) National Conference 2019 titled 'Promoting Learning-centered Classroom Practices' at Bangladesh Agricultural University, Mymensingh held on April 6 Conference Chair and the President of BELTA: Mr. Harunur Rashid Khandelivered welcome address in the program. Ms Rabeya Binte Habib, Senior Lecturer, Department of English and Executive Member of BELTA lead the nine member’s delegation of Daffodil International University. The conference was just another feather on organising big event by BELTA with around 250 participants from Primary, Secondary, Colleges, Madrasahs & Universities. 12 workshops, 8 papers, a keynote and a panel discussion were held during this day-long event; among which 4 workshops and a paper presentation were conducted by DIU participants. Being in a group of three, our nine undergraduates conducted three workshops at the conference. One workshop on "Teaching Pronunciation in Classroom through Fun and Effective Activities" was also conducted by Ms. Rabeya Binte Habib along with a joint paper presentation done by our faculty members: Ms Irina Ishrat, Ms. Afroza Akter Tina, and Ms. Sushmita Rani on Using Exit Slips to Assess Everyday Lesson in an EFL Class. Workshop group 1: Effective Listening Activities for Enhanced Critical Thinking (Title) by Nahid Islam, Rokeya Akter, and Tanzina Noor. Workshop group 2: Teaching Grammar Communicatively in a Low-resourced Classroom by Jannatul Ferdaws, Omme Hafsa, and Fauzia Akter. Workshop group 3: Enhancing Learner Involvement in Classroom Through Interactive Activities (Title) by Jannatul Ferdaus Eishra, Sharmin Sultana Smriti, and Umme Habiba Rima. Here, I would like to share one remark from a participant, a student of Teacher's Training College, Mymensingh and also a primary school Teacher, who mentioned about the usefulness of the low-resourced grammar activities learned at the workshop showing his interest to include those in his own classroom, soon. The BELTA President himself was the session chair for Group 3. Following their presentation, he also shared his positive outlook towards student presentation comparing his own student life hardly bearing any glimpse of such education.